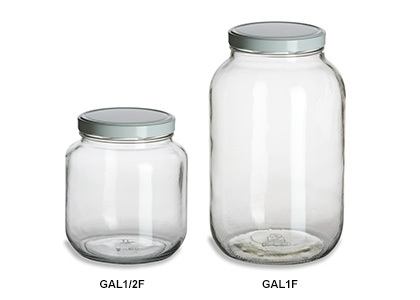 Our half gallon and gallon jars are the gold standard for bulk food storage, canning, and pickling. These robust jars are food safe and made in USA. Our classic storage jars provide an ample labeling surface and full product visibility. Use at home for an organized pantry with your dry goods recognizable at a glance. Many people use our 1-gallon wide mouth without the lid for making kombucha. Both sizes are designed with a wide mouth and white, plastisol-lined twist lug lid, which provides a secure seal for bulk canning. All of our pricing includes both the jar and lid. This product is sold in quantities of 6. This product is sold in quantities of 4.